Antiche Fornaci Giorgi from Ferentino, Italy is sponsoring the appearance of Riccardo Coletta Md. @ IPEG’s 2012 congress to be held on March 6-10, 2012 at the San Diego Convention Center – California – USA. Since 1995 International Pediatric Endosurgery Group is joined by surgeons who practice surgery of children or adolescents with a special interest in Minimally lnvasive Surgery or Therapy. 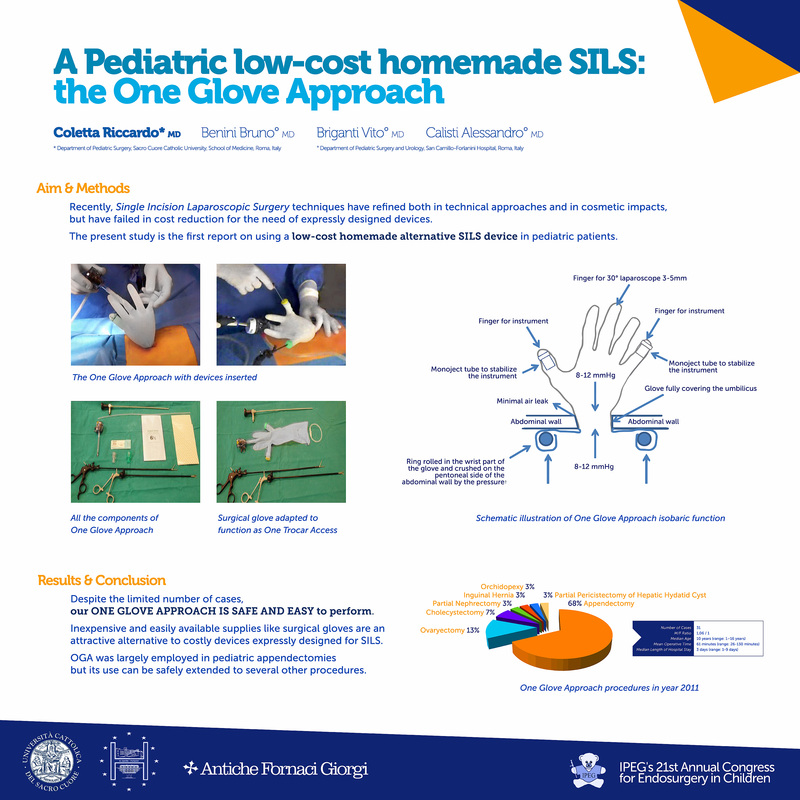 Our poster P079 – A pediatric low-cost homemade SILS: the One Glove Approach is about using one sterile surgical glove as an isobaric chamber to perform laparoscopic surgery via the umbilical hole. This approach replaces particularly crafted instruments, that cost $600+, dropping the expenses to a more feasible $150 cost, making it possible to perform smoothly in critic enviroments like those found in emerging countries. More details asking the author: dr. Riccardo Coletta. Introduction: Recent introduction of SILS techniques (Single Incision Laparoscopic Surgery) has improved technical approach and cosmetic impact of pediatric laparoscopic surgery but did not result in cost reduction for the need of expressly designed commercial devices. The present study is the first report on the use of a low-cost homemade alternative SILS device in pediatric patients. through the first and fifth. There were no exclusions for age but only for clinical reasons (diffuse peritonitis, signs of perforation, cardio circulatory instability). Clinical course and outcome was reviewed. Cosmetic satisfaction was measured using 6-point Likert-type questionnaires. Results: Our modified one-port technique was employed in thirty-one cases (M / F = 1.06 / 1). Median age was 10 years (range 1 – 16), median operative time 61 minutes (range 26 – 130), median length of hospital stay 3 days (range 1 – 9). Sixty eight percent of procedures performed were 21 appendectomies followed by 4 ovariectomies (13%), 2 cholecystectomies (7%), 1 orchidopexis (3%), 1 inguinal hernia repairs (3%), 1 partial nephrectomies (3%) and 1 partial pericistectomy of hepatic hydatid cyst (3%). All patients were discharged after an uneventful postoperative course. Likert score for aesthetic satisfaction was reported excellent. Conclusions: Despite the limited number of cases OGA was safe and easy to perform. Inexpensive and easily available supplies like surgical gloves are an attractive alternative to costly devices expressly designed for SILS. OGA was largely employed in pediatric appendectomies but its use can be safely extended to several other procedures.